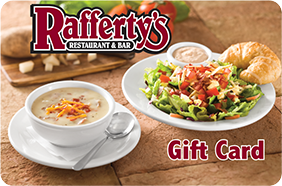 When it comes to Rafferty’s think fresh ingredients and made-from-scratch recipes. When you visit our restaurants, your happiness is our primary concern. That's why we put forth so much extra effort on your behalf. Our popular menu items are prepared from scratch daily. We use the freshest ingredients, and strive to make your visit a memorable dining experience in every way - from the meals we create to the service you receive. Our goal is simple: We want you to come back. Always, make it Rafferty's. To ensure our growth and prosperity we must go to every extreme to guarantee... "No Unhappy Guests, Not Even One!" * For Location Specific Pricing Visit the PDF On Our Locations Page. Freshly made tortilla chips layered with our made-from-scratch queso, homemade chili and seasoned refried beans. Then topped with lettuce, jalapeño peppers, freshly made pico de gallo and sour cream. Original: Fresh hand-breaded deep fried chicken tenders. Served with our special Sweet & Spicy dipping sauce. Tossed: Chicken tenders tossed with our made-from-scratch Buffalo sauce. Served with our homemade Garlic Ranch or Bleu Cheese dressing. Everyday we have our Famous Potato Soup, topped with cheese, chives and chopped bacon OR ask your Server for today’s other made-from-scratch soup. Fresh hearts of romaine lettuce tossed to order with homemade seasoned croutons, Parmesan cheese and Caesar dressing. Add seasoned grilled chicken or grilled salmon for additional cost. Trimmed baby leaf spinach garnished with bleu cheese crumbles, crispy Candied Pecans, thinly sliced red onions and Rafferty’s smoked bacon. We suggest Rafferty’s Hot Bacon dressing. Add seasoned grilled chicken or grilled salmon for additional cost. Two croissants served with Rafferty's homemade Chicken Salad topped with Candied Pecans and choice of today's made-from-scratch soup. Our homemade Chicken Salad topped with Candied Pecans. Served with fresh cantaloupe, honeydew melon and strawberries topped with homemade Sweet Orange dressing. A lunchtime favorite! Sliced smoked turkey, ham, Monterey Jack cheese, Cheddar cheese, bacon, lettuce, sliced tomatoes and our signature Honey-Mustard dressing. Served on toasted wheatberry bread. Served with one side item. A boneless marinated hickory-grilled BBQ Chicken breast topped with bacon, Monterey Jack cheese, pickles, sliced tomatoes, lettuce and mayonnaise. Served on your choice of toasted egg bun or toasted wheatberry bread. Served with one side item. (available after 4:00pm) A juicy cut of our slow-roasted Prime Rib served on our fresh baked French Bread. Served with au jus, and with one side item. A thick juicy Black Angus chuck patty grilled on hickory wood then topped with American cheese, crispy lettuce, sliced tomato, onion, pickles, mayo and mustard. Served on a fresh brioche bun and with one side item. Our American Cheeseburger topped with crispy bacon and served with one side item. A Black Angus chuck patty topped with smoked bacon, charcoal grilled sweet onions, smoked Cheddar cheese and BBQ sauce. Served on a fresh brioche bun and with one side item. A Black Angus chuck patty with melted Monterey Jack cheese, bacon, spinach, tomato, red onion, sour cream and 1000 island dressing. Served on a fresh brioche bun and with one side item. (available after 4:00pm) Our aged USDA choice Prime Rib is seasoned then slow-roasted for tenderness and flavor. Hand-carved to order and served au jus. Served with one side item and our house salad. Our USDA choice hearty 12-oz. Ribeye steak well marbled for full-bodied taste. Served with one side item and our house salad. Our USDA choice thick & juicy 8-oz. Filet slow-roasted over hickory wood. The most tender of all our steaks! Served with one side item and our house salad. Two 6-oz. hickory grilled center cut boneless Pork Chops. Served with one side item and our house salad. Our USDA choice 12-oz. Ribeye marinated in pineapple juice & soy sauce for a great savory flavor. Served with one side item and our house salad. Our USDA choice tender, juicy 10-oz. Sirloin. Served with one side item and our house salad. A generous portion of boneless Chicken Tender Filets served two ways: Original: Fresh hand-breaded deep fried chicken tenders. Served with our special Sweet & Spicy dipping sauce. Served with One Side Item. Tossed: Fresh hand-breaded deep fried and tossed with our made-from scratch Buffalo sauce. Served with our homemade Garlic Ranch or Bleu Cheese. Served with one side item. Our baby back Ribs are hickory smoked in house for tenderness then basted with our sweet & zesty BBQ sauce. Served with one side item. A 7-oz. Salmon filet grilled over live hickory coals. Brushed with olive oil and seasoned or basted Cajun style then blackened. Served with herb tartar sauce. Served with one side item. Our Fish-of-the-Day grilled over live hickory coals. Brushed with olive oil and seasoned or basted Cajun style then blackened. Served with herb tartar sauce. Served with one side item. Salmon marinated in an orange/bourbon marinade, grilled and basted. Served with one side item. 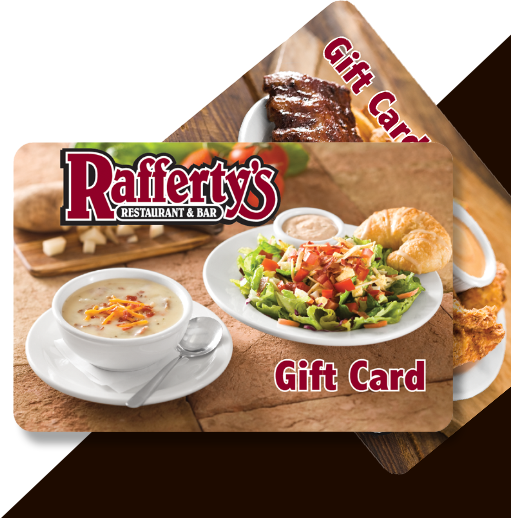 Give the gift of Rafferty’s.